In 1916 James Wilkins, a newspaperman with an engineering degree, lived in Marin County and worked in San Francisco, travelling by ferry both ways each day. Fed up of the travelling he proposed a bridge across the Golden Gate in an article in the San Francisco Bulletin on August 26th 1916. His suggested budget was $10m. The City Engineer, Michael Maurice O'Shaughnessy, responded positively to the article. His endorsement was critical to the advancement of the project. O'Shaughnessy began a national inquiry among engineers regarding the feasibility and cost of the bridge project. The majority of engineers said a bridge could not be built; some speculated it would cost over $100 million. However, Joseph B. Strauss said such a bridge was not only feasible, but could be built for only $25 to $30 million. Subsequently, Strauss submitted his preliminary sketches to O'Shaughnessy, with a cost estimate of $27 million on June 28, 1921. However, it took over a decade to obtain the various approvals required before construction could commence. In the Spring of 1924 an application was made to the War Department, who had jurisdiction over the harbour, for a permit to build the bridge. A provisional license was issued on December 20th 1924 but the final permit was not issued until August 11th 1930. Eleven of the leading bridge builders in the U.S. were requested to submit proposals for constructing the bridge. The design submitted by Joseph Strauss was selected and a contract for almost $24M was awarded in November 1932. 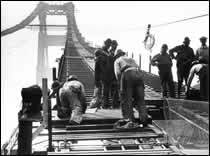 The bridge commenced on January 5th 1933 and was completed and open to pedestrian traffic on May 27th 1937, and to vehicle traffic the following day, ahead of schedule and under budget. The cost of the bridge was financed by Construction Bonds to the value of $35m. This principal sum plus almost $39m in interest were cleared in 1971. 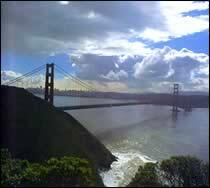 The Golden Gate Bridge was opened to the public on May 27th, 1937. 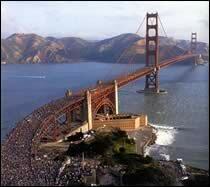 Because of the huge public interest, over 200,000 people paid 5 cents to see this feat of engineering. The Golden Gage Bridge is a suspension bridge and has two main towers, which support the two main cables that carry the bridge deck. With a clear span between the towers of 4,200 ft, the Golden Gate established itself as the longest suspension bridge in the world, a distinction it held until 1964 when the Verrazano-Narrows Bridge, New York was completed. 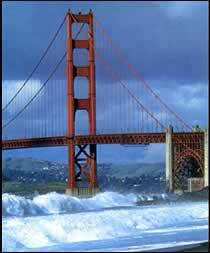 The Golden Gate Bridge is regarded as one of the greatest construction achievements of the 20th Century. The north pier was close to the shore; construction was relatively straightforward. The south pier however was more than 1100 feet offshore and was founded 100 feet below the surface of the open sea amid powerful tides and waves. 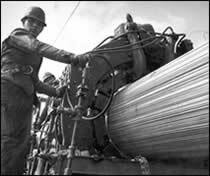 Sculpting machines applied 4500 pounds per square inch pressure and compacted the 61 cable strands into a perfectly round main cable measuring 36 inches in diameter. Sculpted cables then received cable bands which hung the suspender ropes, to which in turn the roadway was fastened. Michael M. O'Shaughnessy (1864 - 1934), the San Francisco City Engineer who commissioned the design and construction of the Golden Gate Bridge graduated as BE (Civil) from NUI, Galway (then the Queens College Galway).